What do you do, Kristen Kremer? To get the right diagnosis for patients, providers must ask the right questions. But with 15-minute visits that typically focus on the main complaint that brought the patients in, how can providers uncover the non-medical reasons behind some patients’ health issues? It can be difficult, but Boston Medical Center has recognized how crucial it is to go beyond basic medical questions to get patients healthy and keep them well. To ensure providers have the tools they need to ask the right questions, the hospital has launched the THRIVE Social Determinants of Health Screening and Referral Program. Patients fill out the screener – currently available in four languages – while they’re waiting to see their provider. Medical assistants then input the patient’s answers in a custom-created EPIC navigator. The Epic input mirrors the paper form, which means it only takes about a minute to complete. EPIC prompts providers to add associated ICD-10 codes to the medical record, so the information can be shared internally and with payors. If patients indicate that they need and want assistance in any of the eight domains, providers are prompted to print THRIVE resource referral guides, which contain contact information for recommended programs. These range from BMC resources such as Elders Living at Home to community resources such as WIC. If appropriate, providers will also connect patients to care coordinators or patient navigators to help connect them to services. The THRIVE Program is currently live in 10 primary care clinics and the Belkin Breast Center. The goal is to eventually screen every BMC patient every six months. Providers are already seeing positive results from the screening. 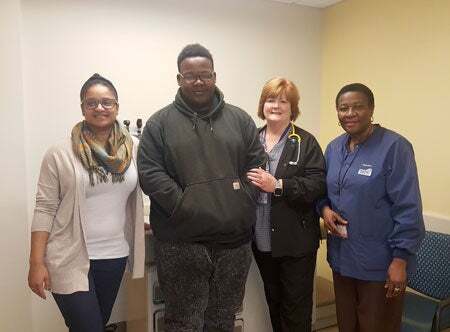 The THRIVE team conducted qualitative interviews with patients and providers and found that some providers indicated that patients they never would have guessed were homeless or food insecure were screening positive. They were then able to incorporate this information into their plans and provide patients with appropriate resource guides. While patients currently get a paper list of resources, the Thrive team is working on building a web-based directory of resources that will be available to both BMC employees and patients. Users will have the capability to filter for resources by social need, by location, and eligibility requirements. The THRIVE Directory is being customized to include resources that BMC employees currently use and have relationships with, to help ensure patients are getting the best possible support. It is due to go live by the summer of 2018. Eventually, the system will also allow for two-way communication between BMC employees and community organizations. For example, a care team member will be able to refer a patient directly to a community partner through the directory. The community organization can then indicate when the individual referred connected with their organization. This enables care teams to better understand what support patients are receiving outside of the hospital system and how well this support addresses their needs. Staff will also be able to add notes about organizations in the directory and provide helpful information and feedback to other staff members. 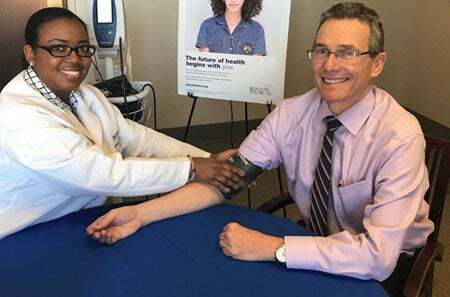 BMC has shared the THRIVE program with other ACOs associated with Boston Medical Center HealthNet Plan, as well as other hospitals across Boston. A similar program will also be going live in BMC’s community health centers’ electronic medical records (OCHIN) by the summer. As data is gathered by the various institutions, they will be able to study the impact of different social needs and identify which interventions have the greatest impact on improving patient health outcomes. 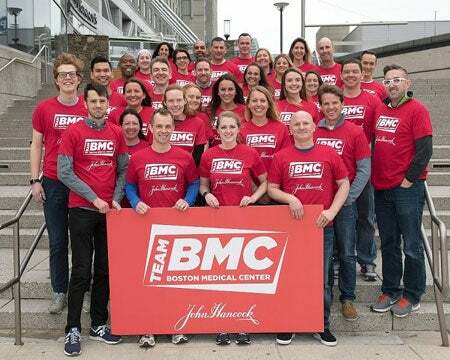 On a cold and rainy Patriots Day, 76 members of Team BMC took to the streets to run the 122nd Boston Marathon. The runners are raising money for BMC’s exceptional programs and services for patients and have so far raised more than $775,000. Twelve of these runners not only supported BMC through 26.2 miles, but also work at the hospital. Here are some of the reasons that they decided to join Team BMC. Team BMC is accepting donations through May 15. Click here to donate. When Armani Lewis reflects on his childhood and early adolescence, he remembers countless days feeling short of breath and weak. He and his family were no strangers to ambulances, emergency room visits, and hospital stays. Asthma, an incurable chronic lung disease marked by recurrent episodes where airways become narrow and tight, was consuming the Lewis family’s lives. In the United States, asthma affects more than six million children in varying degrees, from mild to severe. For kids like Armani, their airways are already inflamed by the disease but are narrowed even more by certain triggers, such as cold air or exercise. The result is a potentially life-threatening asthma attack, marked by coughing, wheezing, chest tightness and shortness of breath. When the medication meant to expand Armani’s airways during an attack was not effective, he was rushed to the hospital. Armani’s doctors at BMC were determined to find the best course of treatment for his asthma. Due to the complicated nature of his disease, it required carefully coordinated care and teamwork between his primary care group led by Pediatrician Sean Palfrey, MD., his pulmonary group headed by Cohen, and his family. Together, they closely monitored and tracked his asthma episodes and triggers and explored different treatment regimens. Then, the biggest sign of improvement: Armani wanted to get fit and try out for the football team. A: I manage patient experience activities across the hospital. That means it’s my responsibility to ensure everyone at BMC has the tools they need to help our patients and their families. Whether that’s the check-in experience, questions about a bill, or visiting a loved one, everyone who works at BMC should be able to provide an exceptional experience. As part of this work, I ensure our leadership teams have the programs, data, and process improvement initiatives they need to help their staff deliver a positive patient experience. I also ensure our providers across campus are engaged in patient experience by working with Dr. Ken Grundfast to manage our team of provider coaches. Finally, I co-chair the Patient Family Advisory Council (PFAC), which launched in 2011. We currently have about 10 patients and family members and three staff members on the council. The goal of the committee is to get patient voices involved in current or proposed projects across campus. We’ve done everything from hosting special events to advising on patient communications and quality initiatives. A: In 2011 I was starting a graduate program at the BU School of Public Health and on one of my very first days after moving to Boston, I took the #1 bus to figure out where my classes were. I very vividly remember driving under Yawkey and thinking that maybe I could get a job there someday. Two days later, I had an interview in Pediatrics. Then I started working at the hospital and have been here ever since. I came into my graduate program after doing 27 months in the Peace Corps in Morocco, where I did a lot of maternal and child health projects. Because of that experience, BMC’s mission really resonated with me. BMC is a place where you can really make a difference for a marginalized, vulnerable group trying to access health care. In many ways, that’s exactly what you’re dealing with in a global health setting. Q: You recently launched a patient experience campaign focused on welcoming, listening, and caring. Why are these the important messages? A: We talk a lot about metrics for patient experience. While those are important and a good way to gauge short and long term success, it’s not exclusively about our percent top box. It’s about how our patients are accessing care, how comfortable they are here, and making sure they come back when they need to. If we all focus on welcoming, listening, and caring our patients will most likely have a great experience when they come here. What we really want to highlight is that everyone plays a role in the patient experience, whether you have a direct patient-facing role or you have more of an administrative role and don’t see patients unless you’re crossing the campus. We know that every encounter from the moment the patient walks through our doors to the moment they leave makes a difference. We get that through formal feedback in surveys, but also through anecdotal feedback patients give us and post on site like ZocDoc or Healthgrades. Q:What are some ways that everyone can help improve patient experience? A: I have three suggestions. One is focusing on what you do when you’re not at your computer and you’re out on the campus – in the lobbies, cafeterias, or other public spaces. Wayfinding is something that’s easy to do. Everyone can help patients find where they’re supposed to go or get them to someone who can. The other component is staff engagement and how we treat each other. Be mindful of the way that you respond to emails or pick up the phone when a colleague is calling. Those acts of kindness and taking care of each other make things easier for all of us to take better care of patients. Lastly, we want to empower employees to handle concerns about patient experience as much as they can in the moment. How can you help a patient solve a problem or answer a question? And if you don’t know the answer, how can you help connect them to the right person? If it’s something that needs to be escalated or needs support, employees should contact Patient Advocacy. A: I love the team atmosphere and that I get to work with people across the organization. I really love that if you have an innovative, creative idea, we have the type of leadership that will help you foster that idea and see it through to its fullest potential. And I love our patients. They’re really dedicated to this organization. For example, some patients who sit on the Patient Family Advisory Council have not only spent their entire lives at BMC – they were born here, got their care here growing up, they brought their kids here for care – but actively take time, even taking time off work, to participate in our council. That to me is really powerful, and I try not to forget that they’re the reason we do all the work we do around metrics and analytics and quality improvement. Q:What do you do for fun outside of work? A: I’m a mom of a 22-month-old little boy, who is very fun. He loves music and loves to eat, so I do a lot of those things. I also have a second child on the way in June, so I get to be a patient here too! If you have questions, comments, or ideas on patient experience, email [email protected]. Imagine if you could impact national health research by taking a few surveys and a short health screening. If you’re one of the 1 million people across the country who are part of the All of Us National Research Program, you can. Boston Medical Center, along with the Partners Health Care System, has been chosen as a site for the All of Us Research Program. The study, which is funded by the National Institutes of Health, is a bold effort to gather data over time from 1 million or more people living in the United States, with the goal of accelerating research and improving health. Researchers will use data from the program to fuel discoveries for a wide variety of health conditions, to learn more about the impact of individual differences in lifestyle, environment and biological makeup. Participation involves completing a variety of surveys about health conditions, lifestyles, and the environment where participants live. Participants are also asked to share information in their electronic medical record, to give blood and urine samples, and be weighed and measured. Researchers will use all of this information to identify the individual characteristics – related to environment, lifestyle, health history, genetics, and other factors – that affect health conditions and outcomes. All study test results that are relevant to health will be shared with participants. Because of concerns around data collection and medical testing, every study site has a community advisory panel to advise on these sensitive topics. BMC’s panel has a diverse group of patients who meet regularly to discuss any potential issues that arise, such as research goals, privacy, and the safeguarding of data. All BMC patients and employees who receive care at the hospital are eligible to participate, and so far, over 1,000 have enrolled. However, this is just a fraction of the 36,000 participants the team hopes to enroll at BMC over the never five years. For more information about how to join All of Us, visit the study's intranet site. Boston Medical Center has been listed on Becker Hospital Review’s “150 Top Places to Work in Healthcare” list. The list features organizations that offer benefits and opportunities for employees to build successful careers above and beyond the average health care company, encourage professional development, offer unique wellness and personal benefits, and have an employee recognition program. For the second year in a row, BMC has received a Top 25 Environmental Excellence Award from Practice Greenhealth! The highest honor exemplifies BMC's environmental excellence and groundbreaking achievements and innovation in health care sustainability. In addition, BMC won three Circles of Excellence awards from Practice Greenhealth, in energy, climate, and green building. These awards honor up to ten of the highest performing hospitals nationwide in each area of sustainability expertise. BMC has been designated a LGBTQ Healthcare Equality Leader by the Human Rights Campaign. The status is awarded to healthcare facilities that attained a score of 100 in the Healthcare Equality Index (HEI) 2018. 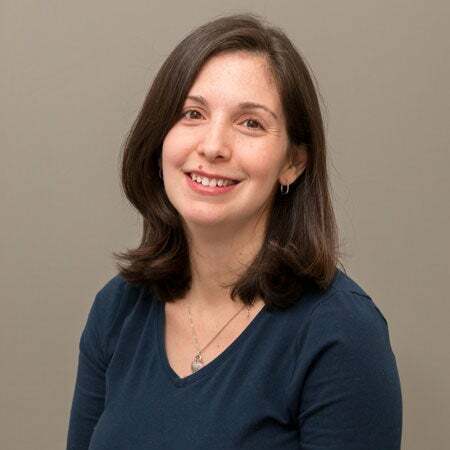 Megan Sandel, MD, a pediatrician at BMC, has been honored by the Massachusetts Medical Society with its annual Reducing Health Disparities Award. The award recognizes an individual who has made outstanding contributions to reducing health disparities due to race, socioeconomic status, age, education, or sexual orientation. Sandel was honored for her work at Children’s HealthWatch, her time as medical director for the National Center for Medical-Legal partnership, and her leadership in bringing awareness to the social determinants of children’s health and advocating on behalf of her patients. Arthur Harvey III, vice president and CIO, has been named one of 105 hospital and health system CIOs to know by Becker’s Hospital Review. Harvey was honored for his success in revising the IT governance process and management structure and his leadership of the Epic implementation. Under his leadership, BMC has earned the Hospitals & Health Networks' Health Care's Most Wired honor twice. David Harrison, MD, a physician in the Department of Obstetrics and Gynecology has been named Suffolk Medical Society’s 2018 Community Clinician of the Year. The award recognizes his professionalism and contributions as a physician, at BMC and at the South Boston Community Health Center.